What could be more satisfying than a hearty bowl of corn chowder? Corn chowder is an American soup with recipes for it dating back to the 1800’s. 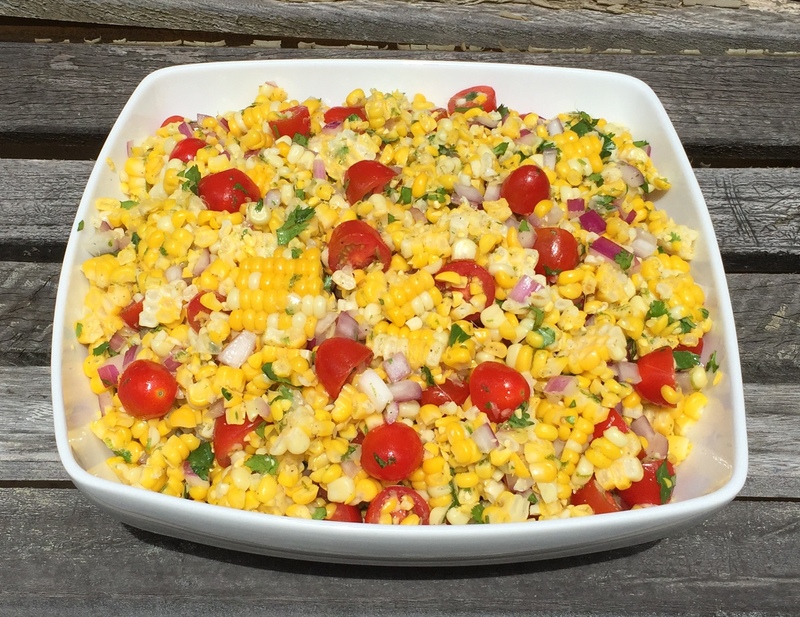 It’s delicious made with fresh corn kernels when corn is in season. But when corn isn’t in season, you can still turn out a delicious pot using canned corn. I started adding carrots to my corn chowder just as a way to sneak more veggies into my kids’ diets, but you could omit the carrots if you prefer. Sometimes I leave them out (as pictured below) and the soup still turns out fabulous. Cook bacon in a large heavy stock pot over moderate heat until crisp. Using a slotted spoon, transfer bacon to paper towels to drain. Set aside. Remove all but 2 tablespoons of bacon grease from pot, then add garlic, onion, celery, and carrots. Cook, stirring occasionally, until onion becomes translucent. Add broth, potatoes, and thyme and simmer, covered, until potatoes are just tender. Stir in corn kernels, half-and-half, salt, and pepper. Simmer, uncovered, about 10-12 minutes. Remove sprigs of thyme before serving and garnish with crispy bacon. NOTE: If corn is not in season, lessen the chicken broth to 3 cups and replace the fresh corn with 2 cans whole kernel corn, undrained, plus 2 cans cream-style corn. Summer is State Fair time in California. The State Fair makes me think of corn dogs. I love corn dogs. Corn dogs bring back warm, fuzzy memories of state fairs and carnivals past. There’s nothing like wandering around the fair taking in all the sights and smells with a corndog-on-a-stick smothered in mustard clutched in your hand. I saw a recipe for mini corn dog muffins on the Kraft website and thought they looked like fun so I decided to try it. They turned out so good! The Kraft recipe has you poke a little cube of cheese into the muffin next to the hotdog. That actually sounds yummy to me too! I’m going to have to try that next time! I remember eating cheese dogs when I was a kid. A cheese dog was basically a hotdog-on-a-stick but with a log of gooey, melty cheese in place of the hotdog. They were oh-so-good! If you can’t make it to the State Fair, give these tasty little muffins a try. They’re baked so they’re a healthier alternative to a deep-fried corn dog, but they’re every bit as nostalgic and addictive! Preheat oven to 400ºF and grease 24 mini muffin cups. Prepare cornbread muffin mix according to package directions. Fill muffin cups half full with cornbread batter. 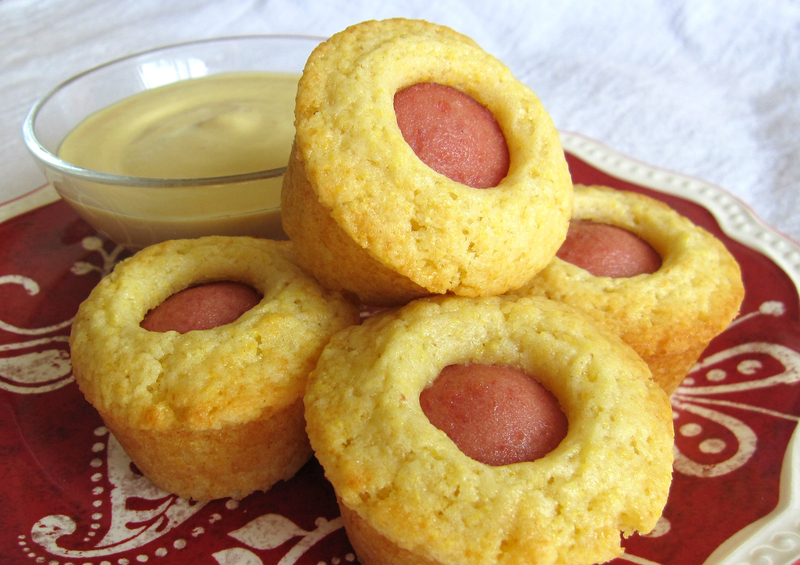 Push a piece of hotdog down center of batter in each cup. Allow to cool for 5 minutes, then remove from muffin pan. Combine mayonnaise and mustard in a small bowl. Blend well with a wire whisk. My Old Goat made his special Chili con Carne for dinner tonight. He doesn’t really cook but he does have a small repertoire of dishes that he makes when I’m not around and kitchen duty falls on his shoulders. He makes a mean grilled cheese sandwich, his Chili con Carne is really yummy, and he’s especially proud of his burgers. He keeps tweaking his burger recipe trying “to perfect it” as he says, which is really funny to me because I think it’s already perfect as it is. Anyway, I was actually home this evening but Old Goat suddenly got a hankering to make Chili so I told him to go ahead and knock himself out. I could always use a break from fixing dinner. Not that I got a break. Instead I ended up making some Bacon Cheddar Cornbread Muffins to serve with his chili. These muffins are a great accompaniment to chilis, barbecues, even soups. They’re really easy to make because you start with a boxed cornbread mix. Give them a try at your next chili cook-off. I promise you’ll love ’em! Preheat oven to 400ºF. Grease muffin pan with non-stick cooking spray. In a medium bowl, stir together milk, oil, egg and full box cornbread mix until moistened. Stir in corn, bacon, cheese and green onion. I love corn. I love it boiled, baked, grilled, on the cob, off the cob, plain, or with butter and seasonings. Any way you fix it, it’s all yummy to me. And I found a really easy way to shuck corn that gets rid of every bit of silk, too. You can watch how to do it here. Who knew? I first tried this salad at a party at my sister’s house. It was made by Nadja, a friend of my sister, who got the original recipe from Epicurious. It’s easy and delicious. The lime juice imparts a bright flavor that’s so refreshing on a hot summer’s day. It’s no wonder this tasty salad has fast become a family favorite. 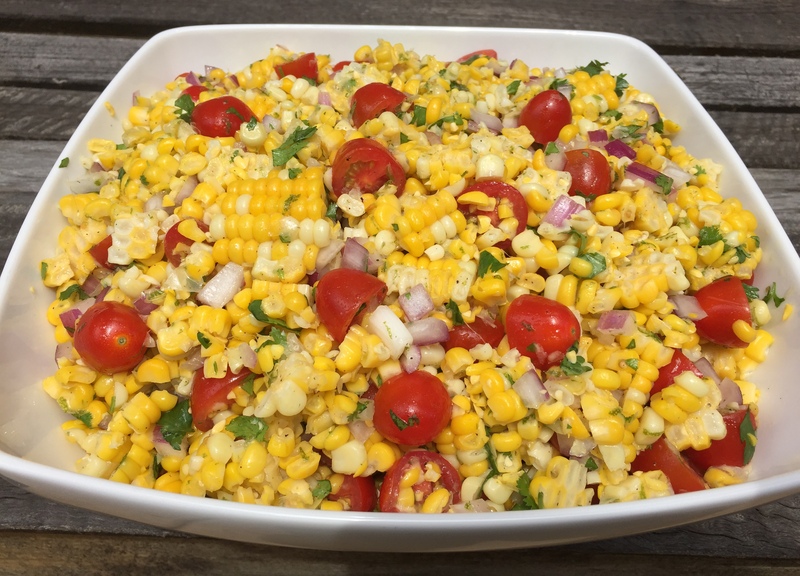 Combine corn, avocado, tomatoes, red onion and cilantro in a large bowl. In another bowl, mix together the rest of the ingredients to make the dressing. P.S. – You’re right, there is NO avocado in the salads pictured. I completely forgot to add the avocado before I took the photos and after I tossed the avocado in, the family devoured the salad before I could take new pictures. Sigh…. Oh well…. You get the picture (pun intended).